Gladstone Hotels - Gladstone Hotels, Australia. Access point for Heron Island. In the thriving city of Gladstone, in Central Queensland Australia, you'll find a range of accommodation facilities including first class hotels, motels and backpacker accommodations. Gladstone has a limited number of hotels, although it has a substantial number of motels. The two main hotels in town are the Metro Hotel and Apartments and the Country Plaza. 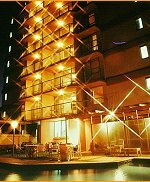 The Metro is an apartments/suites hotel consisting mainly of one bedroom apartments accommodation, whereas the Country Plaza Hotel is more of a traditional hotel come-motor inn. Gladstone is a thriving city in Queensland and travel and tourism is a growing industry. Many tourists stay in hotels in Gladstone whilst exploring nearby Heron Island and the southern parts of the Great Barrier Reef. The Metro Hotel & Apartments is Gladstone's premier hotel property. Rated 4 stars, the Metro comprises 50 x one bedroom apartments, all with balconies, looking out over the harbour and city. Each apartment consists of a bedroom, separate living room, and fully equipped kitchen, and laundry. The apartments are fully furnished, and provided with linen, crockery, and cutlery, and are fully serviced on a daily basis, or as required. Situated in the very centre of the Gladstone CBD, the Metro Hotel & Apartments is ideal for business, and leisure travellers. Just a short walk, and you're at the marina, and jetty, where you can board the many craft cruising the islands, exploring Heron Island, and the southernm parts of the Great Barrier Reef. The hotel has an on-site restaurant, and bar, and has an outdoor swimming pool, and BBQ area. The Metro has undercover security parking, which is easily accessed, and it's complimentary.